I was staring at the Facegrabber one day and it occurred to me that if I moved the fpv cam a bit forward I could drop it quite a bit and use 20mm standoffs. Shorter standoffs would be more impervious to bending in crashes. I chose 645 nylon for the Facegrabber so that its stiffness would tie the four standoffs together and have them resist impacts as a group. With short little 20mm standoffs there's less need for that rigidity from the pod, so I'd be able to use TPU, which is more indestructible than nylon. So I started drawing. 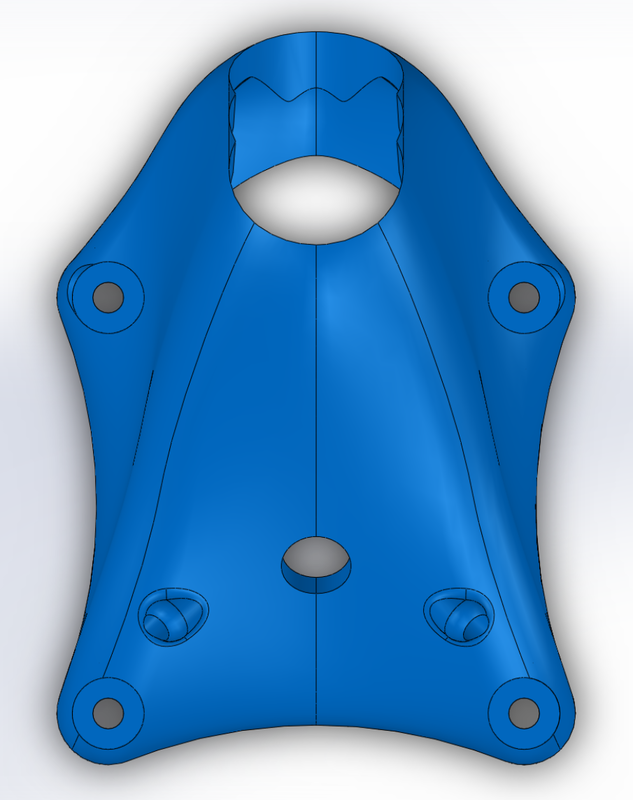 I've recently started creating pods in Solidworks with surfacing rather than lofting solids, and this tiny little part really demanded all my newfound skills. Surfacing lets you build solids in facets, which gives you much more control over the final shape. This little part had so many tight twists and turns that it kept giving me faulty geometry errors, forcing me to learn all new ways to do the same things. It took about three complete re-draws to get the first printable file, which was full of inelegant workarounds to avoid all the geometry errors. The shell was 2mm thick, which worked well in nylon but was too thin for TPU. The nylon pod flew great 'til a head-on with S3 prez Toasta Mahogey sheared it in half, further reinforcing the need for a TPU pod. I tried to increase the shell thickness to 2.5mm but the part just exploded into bits. The file just wasn't robust enough to stand up to edits. The first version on a 1407 Flaco. The surfaces of the pod. Internal features are drawn and sliced using the pod's surfaces. The pod is turned into a solid, shelled, and combined with the internal features. 2 holes cut for the cam lens, 1 to go. This view is why it's called the wingsuit. Prints nice and clean now. 20mm standoffs stand up to impacts better.